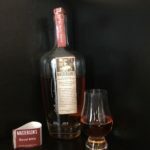 A flawed offering from Masterson's, this Rye leans far too heavily on the ultra-sweet and citrus flavors to the detriment of all else. Masterson’s Rye is a whiskey distilled in Canada from a mash bill that consists 100% of rye. While many whiskeys utilize rye in the recipe, and most bourbons use it as a secondary grain, 100% Rye whiskeys are somewhat rare, and very difficult to distill. Masterson’s is produced by 35 Maple Street, a Sonoma, CA based NDP (Non-Distilling Producer) connected with the Sebastiani wine-making family. The Name “Masterson’s” is appropriate for this whiskey line, as it is named for famed Wild West law man William “Bat” Masterson. Like this whiskey, Masterson was Canadian born. Alberta Distillers, Ltd. is among the current pioneers of all-rye whiskey distilling, and produces rye whiskeys for several other major NDPs, and is the source for Masterson’s Rye. 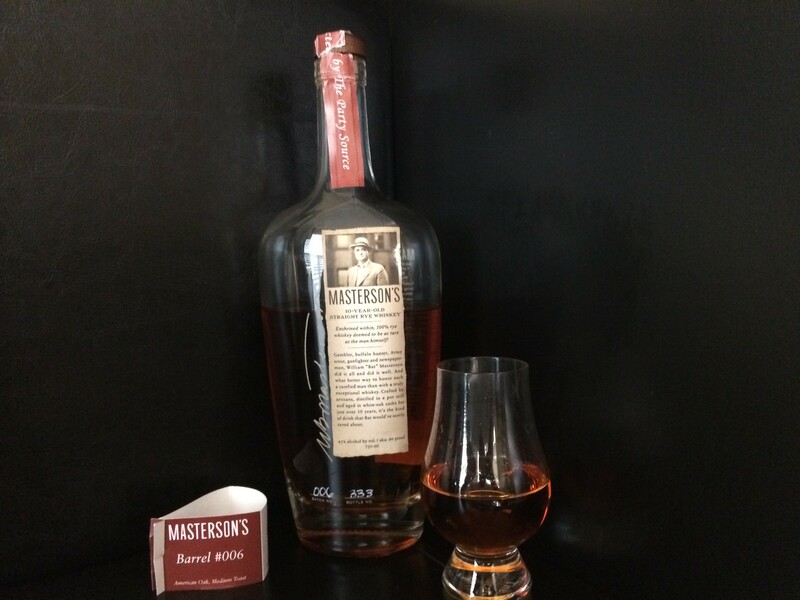 Masterson’s Rye is packaged in an elegant oval bottle with wide shoulders and a vertical label along the right side, with “Masterson’s” screen-printed on the bottle. Well done. Medium Gold in color, this is a pale, sparkling appearance. Heavy floral scents greet the nose with a crisp rye bite. There are pronounced citrus notes on the nose as well, making the nose of this whiskey trending almost towards a liqueur such as Southern Comfort. The rye is crisp on the tip of the tongue with a sharp, biting nip. It is followed up by sweet candied peaches, orange, mint, and even pine needles. There is very little of the barrel to speak of here- oak and age evident in many bourbons seem to be secondary, at best. This is about the rye. The taste lingers with this one, probably longer than I would prefer, as the sweet and citrus characteristics eventually turn just a touch bitter. I am told the distiller is the same distiller who produces Jefferson’s Rye and Whistlepig. If so, it is very clearly barreled and aged in very different methods, as this is a completely different animal. In fact, it’s not a good animal. The sweetness of this whiskey is apparent from the first whiff to the final finish, and that may be off-putting to some more hard-core whiskey fans, but I suppose it may be appealing to those new to the spirit or those seeking a break from traditional bourbon and scotch flavors. For me, it would probably work best over ice on a hot summer day by the pool, but I find the citrus and floral characteristics far too strong for my tastes, so I can’t recommend buying a full bottle, as prices range from $60 to as high as $80. Flawed. ModernThirst.com Score: 82 out of 100. Could not disagree more. This is as fine a Straight Rye as I have ever tasted. 90+ for me. I’ve just come to this site and it seems the inconsistencies are glaring. and an 82 for Masterson’s, a 100% 10 yr. rye because it’s to floral and sweet. To each his own. If you enjoy Masterson’s, by all means continue to do so.